The Hoya 49mm Star-6 Filter is designed to be used perpendicular to a point light source such as the sun, a light bulb, or a candle. Within the filter's surface is a combination of fine, etched line types that help to create a starburst effect with six primary diffraction spikes that extend from the light source. This filter is most effective for pictures where the light source used to generate the starburst effect is a highlight with a significant degree of contrast from the rest of the image. The Hoya 49mm Star-6 Filter is constructed from optical glass for clarity as well as color fidelity, and features an aluminum-alloy filter ring for durability while remaining lightweight. 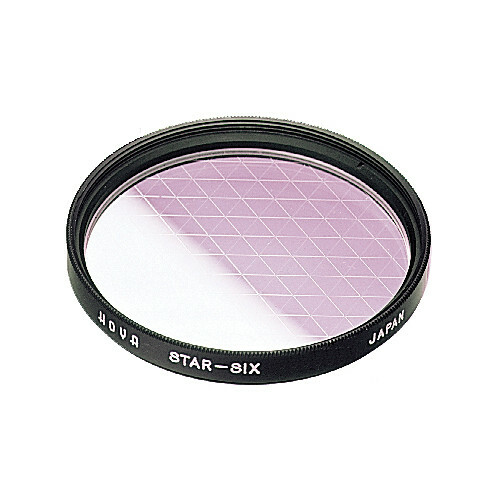 Box Dimensions (LxWxH) 2.9 x 2.8 x 0.5"
49mm Star-6 Filter is rated 5.0 out of 5 by 2. Rated 5 out of 5 by Carolynn from The star filters are routine on TV shows. I had a 30+ year old filter for my 1980 Minolta camera and got many beautiful pictures with it. Somehow, when I moved 4 years ago, I lost this filter and was extremely distressed. I was delighted that I could replace it and expect to use it for 30 years more. I also can't find my fish-eye lens, but will manage without it. Yes, I still use film and am pretty darn good with it - I have had some published and won awards. I bought a Canon Rebel camera recently in an attempt to enter the digital age, but do not yet know how to use it. No hurry. I still have my old Minolta that works perfectly. I even took 3-D photos (with film) which are awesome. Rated 5 out of 5 by Anonymous from Great star filter Great quality filter. Creates a nice clean, crisp star without getting a glare like some of the cheaper versions. which lens will this filter work best with?